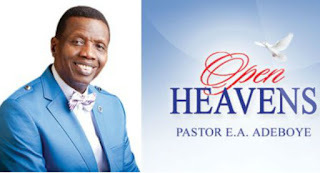 Open Heaven 26 October 2018 [Friday] Daily Devotional By Pastor E. A. Adeboye – Who is my neighbour? The title of today’s devotional is a question which precipitated the parable of the Good Samaritan. This question is even more relevant today because the character of good neighborliness is fast becoming a scarce commodity. Through this scripture, the holy saying that there is no good neighborliness in theoretical spirituality that is not accompanied by action. In today’s Bible text, our Lord used the actions of the Samaritan to vividly illustrate good neighborliness, contrasting his charitable deeds against the selfish attitudes of the priest and the Levite. It is unfortunate that the actions of the letter two reflect what is happening among Christian brethren today. To the pastor, the sick child of the neighbor may die, as long as he is not late to preach somewhere. A chorister would not want to be late for choir practice, even though the follow sister is critically ill somewhere. Beloved, the Holy Spirit demands that we add virtue to our faith (2nd Peter 1:5). When we add the virtue of good deeds to our faith, the task of our evangelizing the word will become very easily to accomplish. The story was told of the General Overseer of a reputable church in Lagos, Nigeria, whose decision to accept Christ was motivated by the kindness of a Christian couple during the Nigeria civil war. He wondered what kind of people would give a bowlful of rice to him, a hungry fugitive who was about to die, at a time when food was terribly scarce. He found out that they where Christians, and there and then he decided to join them in serving Jesus. Beloved, let your faith come alive today with good works. Prayer Point: father, please help me to add the virtue of good neighbor to my faith, so that the light of Christ may shine through me to the word.